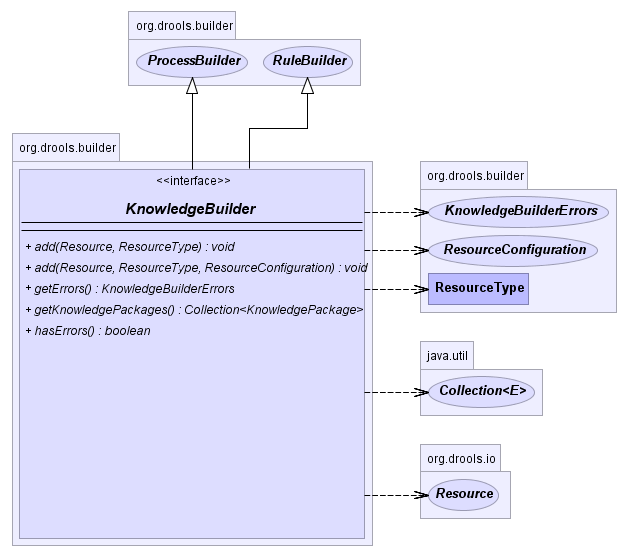 The KnowledgeBuilder is responsible for taking source files, such as a DRL file or an Excel file, and turning them into a Knowledge Package of rule and process definitions which a Knowledge Base can consume. An object of the class ResourceType indicates the type of resource it is being asked to build. The ResourceFactory provides capabilities to load resources from a number of sources, such as Reader, ClassPath, URL, File, or ByteArray. Binaries, such as decision tables (Excel .xls files), should not use a Reader based resource handler, which is only suitable for text based resources. 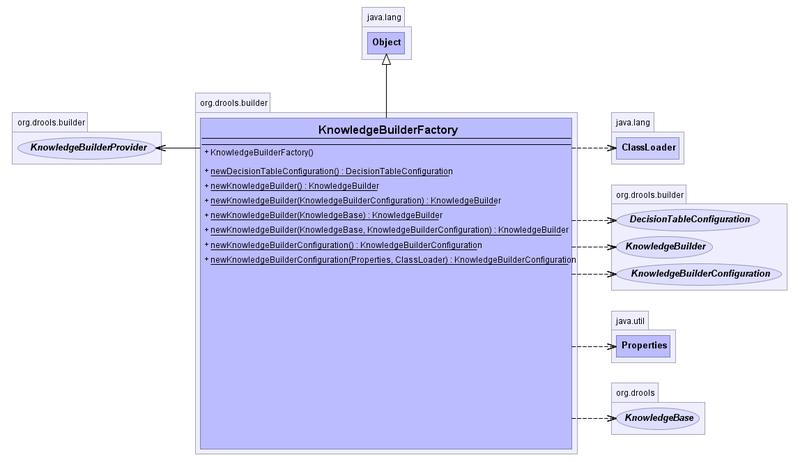 The KnowlegeBuilder is created using the KnowledgeBuilderFactory. Resources of any type can be added iteratively. Below, a DRL file is added. Unlike Drools 4.0 Package Builder, the Knowledge Builder can now handle multiple namespaces, so you can just keep adding resources regardless of namespace. It is best practice to always check the hasErrors() method after an addition. You should not add more resources or retrieve the Knowledge Packages if there are errors. getKnowledgePackages() returns an empty list if there are errors. When all the resources have been added and there are no errors the collection of Knowledge Packages can be retrieved. 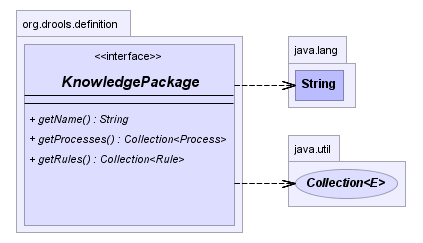 It is a Collection because there is one Knowledge Package per package namespace. 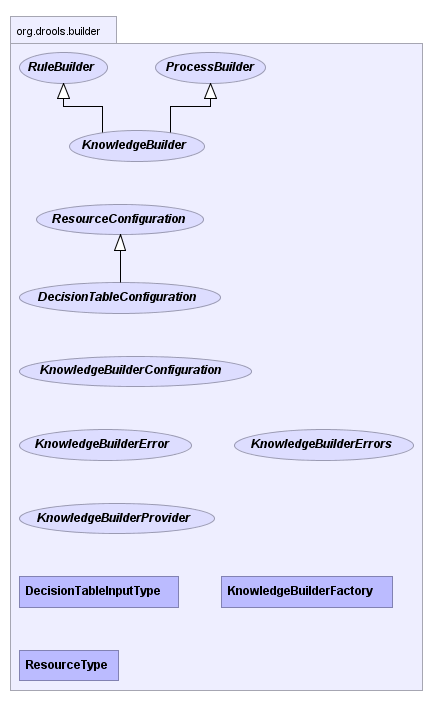 These Knowledge Packages are serializable and often used as a unit of deployment. ChangeSets can include any number of resources, and they even support additional configuration information, which currently is only needed for decision tables. 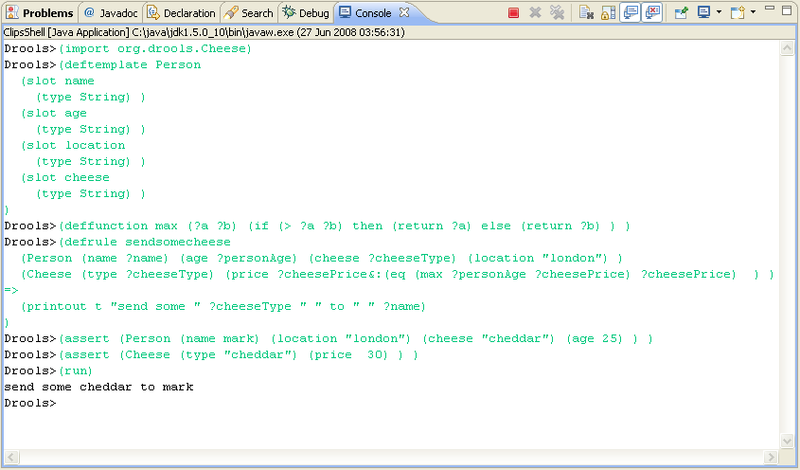 Below, the example is expanded to load rules from a http URL location, and an Excel decision table from the classpath. The ChangeSet is especially useful when working with a Knowledge Agent, as it allows for change notification and automatic rebuilding of the Knowledge Base, which is covered in more detail in the section on the Knowledge Agent, under Deploying. 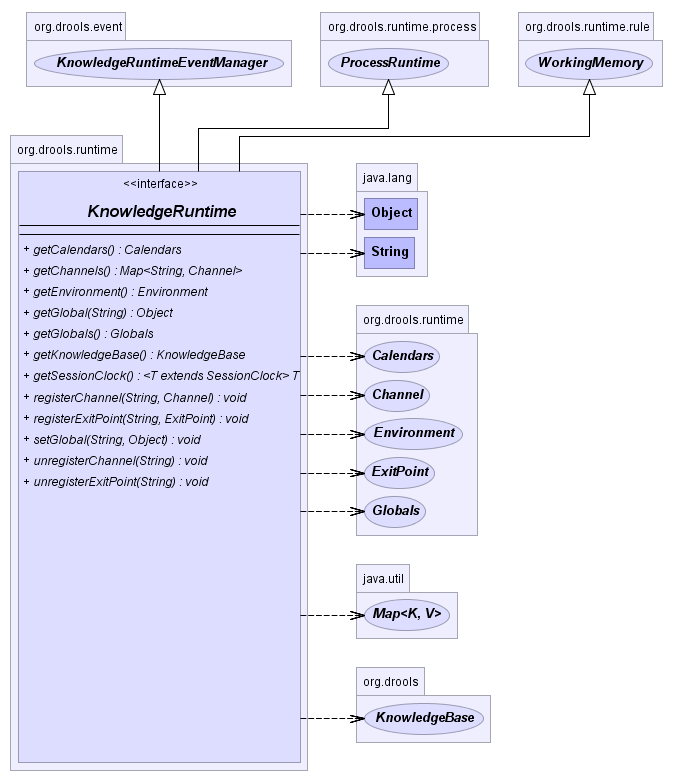 The Knowlege Base is a repository of all the application's knowledge definitions. 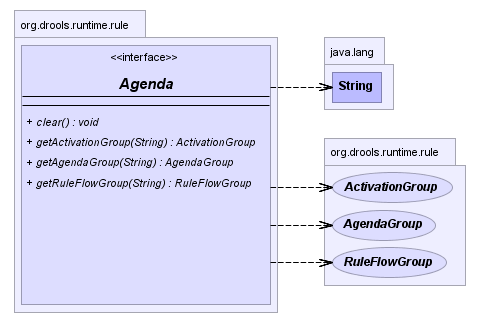 It may contain rules, processes, functions, and type models. The Knowledge Base itself does not contain instance data, known as facts; instead, sessions are created from the Knowledge Base into which data can be inserted and where process instances may be started. Creating the Knowlege Base can be heavy, whereas session creation is very light, so it is recommended that Knowledge Bases be cached where possible to allow for repeated session creation. 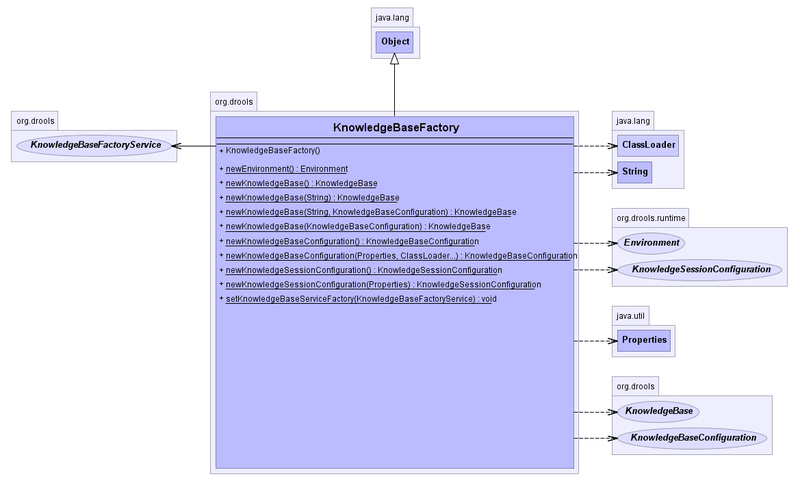 The KnowlegeBase is created using the KnowledgeBaseFactory. 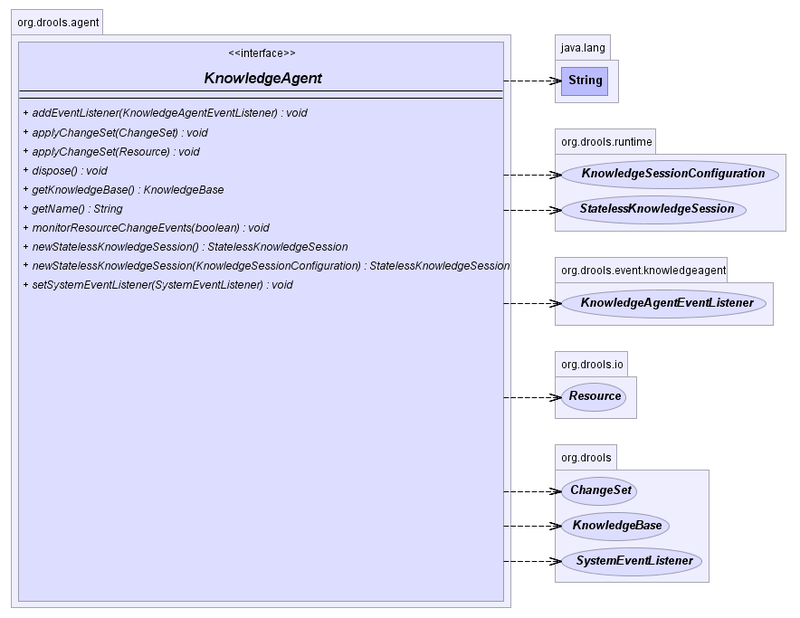 The KnowlegeBase is a repository of all the application's knowledge definitions. 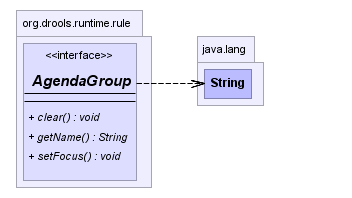 It will contain rules, processes, functions, and type models. The Knowledge Base itself does not contain data; instead, sessions are created from the KnowledgeBase into which data can be inserted and from which process instances may be started. Creating the KnowlegeBase can be heavy, whereas session creation is very light, so it is recommended that Knowle Bases be cached where possible to allow for repeated session creation. Insertion is the act of telling the WorkingMemory about a fact, which you do by ksession.insert(yourObject), for example. When you insert a fact, it is examined for matches against the rules. 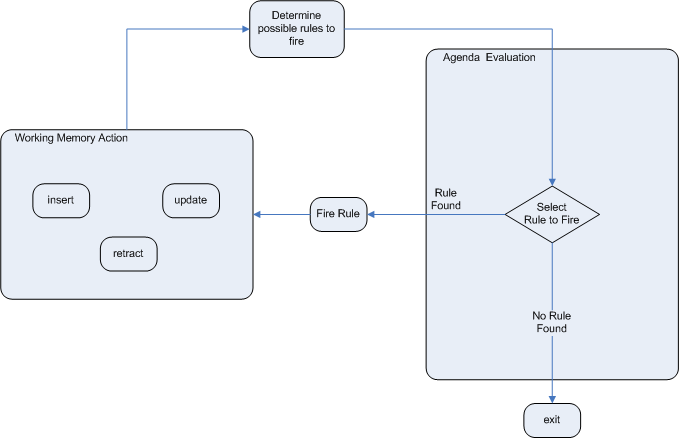 This means all of the work for deciding about firing or not firing a rule is done during insertion; no rule, however, is executed until you call fireAllRules(), which you call after you have finished inserting your facts. It is a common misunderstanding for people to think the condition evaluation happens when you call fireAllRules(). Expert systems typically use the term assert or assertion to refer to facts made available to the system. However, due to "assert" being a keyword in most languages, we have decided to use the insert keyword; so expect to hear the two used interchangeably. 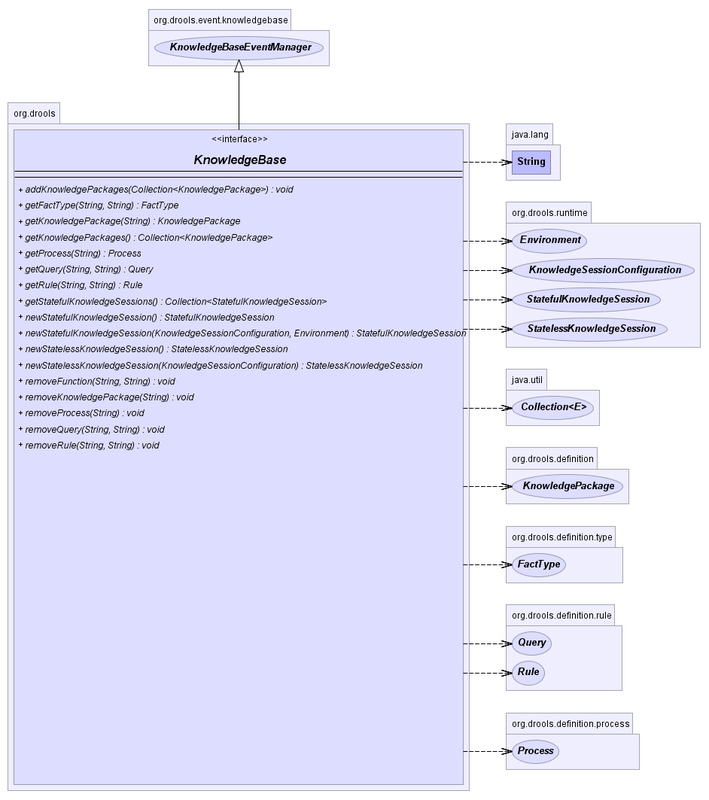 Identity means that the Working Memory uses an IdentityHashMap to store all asserted objects. New instance assertions always result in the return of a new FactHandle, but if an instance is asserted again then it returns the original fact handle, i.e., it ignores repeated insertions for the same fact. 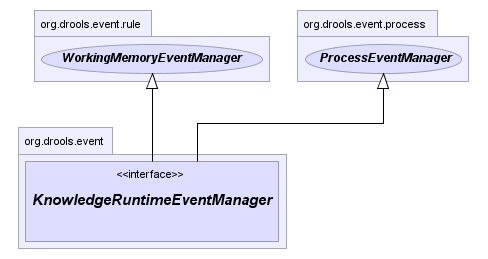 Equality means that the Working Memory uses a HashMap to store all asserted Objects. New instance assertions will only return a new FactHandle if no equal objects have been asserted. Retraction is the removal of a fact from Working Memory, which means that it will no longer track and match that fact, and any rules that are activated and dependent on that fact will be cancelled. Note that it is possible to have rules that depend on the nonexistence of a fact, in which case retracting a fact may cause a rule to activate. (See the not and exist keywords.) Retraction is done using the FactHandle that was returned by the insert call. The Rule Engine must be notified of modified facts, so that they can be reprocessed. 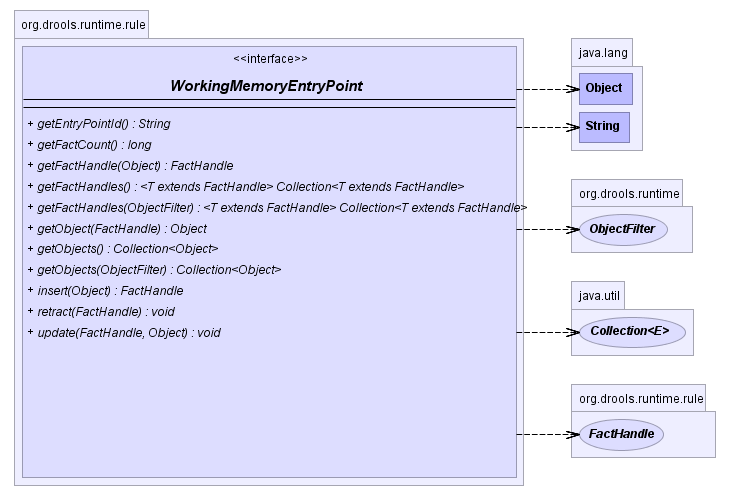 Internally, modification is actually a retract followed by an insert; the Rule Engine removes the fact from the WorkingMemory and inserts it again. You must use the update() method to notify the WorkingMemory of changed objects for those objects that are not able to notify the WorkingMemory themselves. Notice that update() always takes the modified object as a second parameter, which allows you to specify new instances for immutable objects. The update() method can only be used with objects that have shadow proxies turned on. 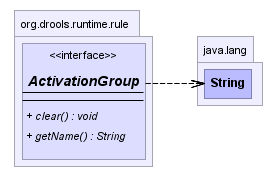 The update method is only available within Java code. On the right hand side of a rule, also the modify statement is supported, providing simplified calls to the object's setters. 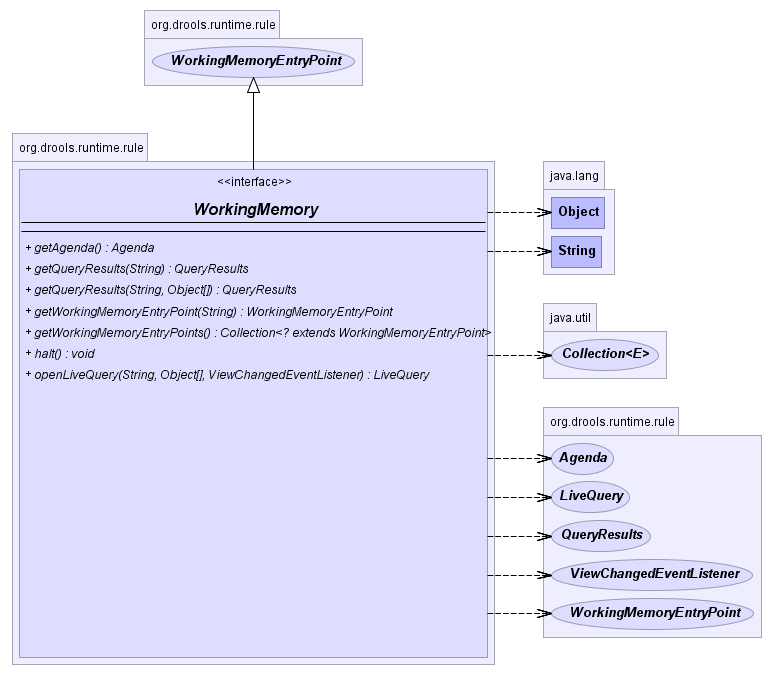 The WorkingMemory provides access to the Agenda, permits query executions, and lets you access named Enty Points. 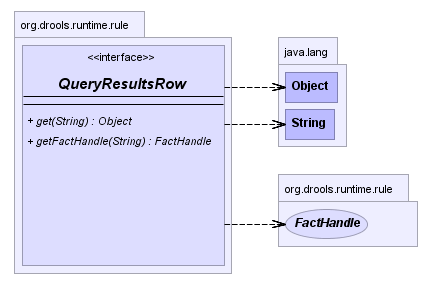 Queries are used to retrieve fact sets based on patterns, as they are used in rules. Patterns may make use of optional parameters. 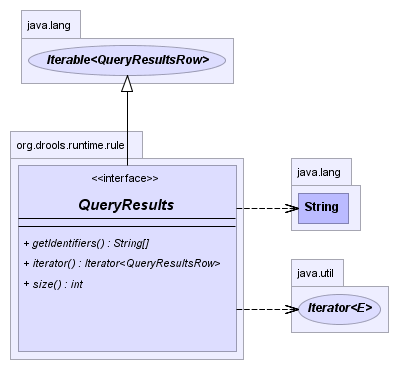 Queries can be defined in the Knowlege Base, from where they are called up to return the matching results. While iterating over the result collection, any bound identifier in the query can be accessed using the get(String identifier) method and any FactHandle for that identifier can be retrieved using getFactHandle(String identifier). We have now complimented this with Live Querries, which has a listener attached instead of returning an iterable result set. These live querries stay open creating a view and publish change events for the contents of this view. So now you can execute your query, with parameters and listen to changes in the resulting view. 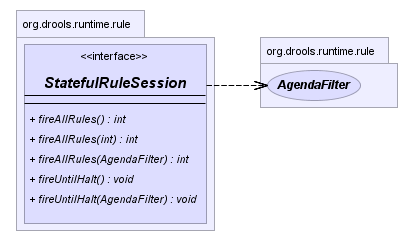 The KnowledgeRuntime provides further methods that are applicable to both rules and processes, such as setting globals and registering Channels (previously exit points, some references may remain in docs for a while). 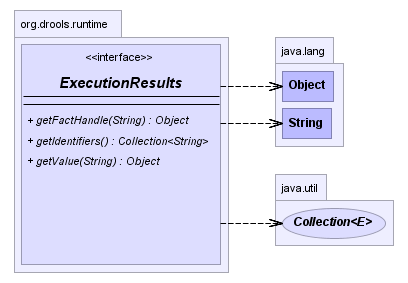 Globals are named objects that can be passed to the rule engine, without needing to insert them. Most often these are used for static information, or for services that are used in the RHS of a rule, or perhaps as a means to return objects from the rule engine. If you use a global on the LHS of a rule, make sure it is immutable. A global must first be declared in a rules file before it can be set on the session. If a rule evaluates on a global before you set it you will get a NullPointerException.